1. It’s known to Italians as the Sleeping Beauty City (La Bella Addormentata). Mantua thrived during the Renaissance, when the noble Gonzaga family was in power and brought great art and creativity to the region. Today, its beautiful art and architecture are alive and well, and the city’s impressive skyline includes castles, domes, and towers. 2. It’s Italy’s most livable city (as voted by Legambiente, an Italian ecology group). Mantua is close to the oft-visited Verona, fabled home of Romeo and Juliet, but many travelers overlook this small town. Mantua is surrounded by wetlands, leaving the city’s small size and population (48,000 people) similar to that of its Renaissance days. The city is affordable to visit compared to the rest of Italy, and is largely unaffected by urban development. 3. It was the home of royalty. The Gonzaga family ruled Mantua for nearly 400 years, from 1328 to 1708. As a result, these nobles became well-known and celebrated and, of course, built their own palace. After the Vatican, the Palazzo Ducale is the second-largest residence in Italy, with 500 rooms, a castle, gardens, frescoes, and art galleries. 4. Mantua has excellent food. The city’s most notable food products are pumpkins (often used in filled pastas) and stracotto d’asino, a stew made with donkey meat and cooked for eight hours. Though many restaurants that serve visitors now use beef instead, locals still take pride in and prefer the dish in its original form. When it’s time for the daily aperitivo, many bars serve a free buffet of snacks such as pizzette, pasta, cheese and charcuterie. 5. It has been the setting for several of Italy’s most beloved works of art and artists. Mantua has influenced Giuseppe Verdi’s opera Rigoletto, Shakespeare’s Much Ado About Nothing and Romeo and Juliet, and was the birthplace of Virgil. 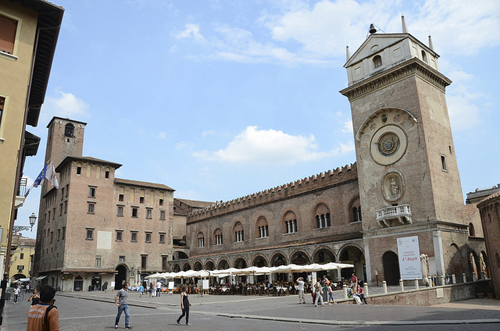 Over the years, famous visitors to the town such as Peter Paul Rubens, Giulio Romano, and Petrarch enriched its history, and their traces can still be seen in Mantua today. This is a really good page; thank you!